Paper Makeup Stamps: It's time to Rethink! Rethink your first PMS card that is! Tangii and Christi came up with an awesomely fun challenge for the PMS family to do the entire month of February in honor of our first birthday/anniversary! The challenge is to dig out your first PMS card and rethink it. or you can just rework it. Maybe to better show off your skills 1 year later, or maybe you have more fun supplies, or maybe there is just something that you think would make it better. Maybe your original card is just an inspiration to a new one! Whatever the case is.... rethink your card, and execute it! So all month long (on sundays and tuesdays!) the Paper Makeup Artists are going to be showing off their first card and then rethinking it! To start things off... Christi and I are going to show our cards first! Here is my very first PMS card. I'm not sure if it qualifies since it's not a stamped image, but it's the original drawing the image came from! And i used it on a card to my hubby. 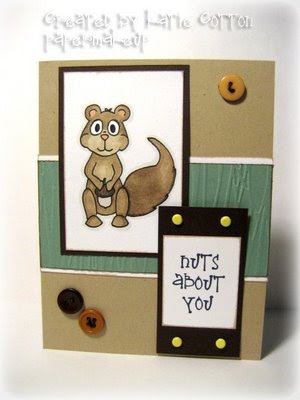 And the rethunk version, using the actual stamps from the Nuts About You set! You can read all about that first card, and my announcement of my starting PMS here. And here's her rethunk version (which in her case, is a little more of going off the inspiration of the first card.... which is a great idea too!) 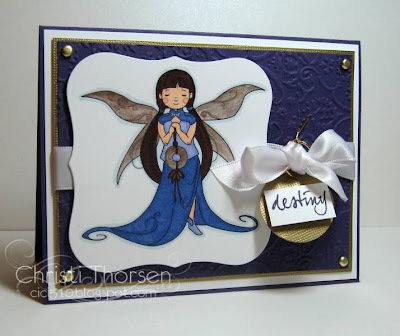 She has used Penelope, one of the very first of the Beautiful Day Fairies! Thanks so much for stopping by today! We'd love to hear what you think about YOUR first PMS card! Feel free to join in on this challenge thats going on all month long! What a great idea! It's so fun to look back and see how far you've come! These are both fabulous re-thunks! LOL! It was fun to rework my own first PMS card! I think these are all fabulous cards!! wow! so fun to see the new takes on the originals! Thanks for starting the challenge! Both are great remakes! What a fun challenge!